This post was originally posted in the Online Magazine of University of London, London Connection. LLB students from Pakistan College of Law have once again shown their Mooting prowess by scooping awards at two separate Moots. The first Moot, on Cyber Laws, was conducted by Lahore University of Management and Science (LUMS) on 30 November 2013. 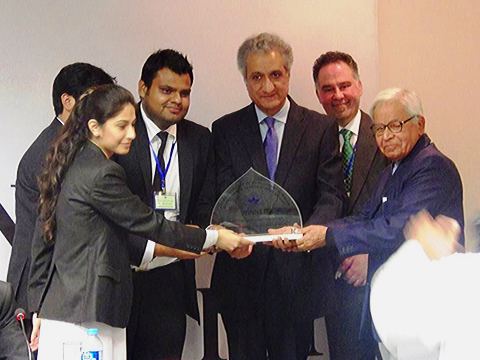 This was the fourth National Moot hosted by LUMS. LLB students Muhammad Mustafa, Khushbakht Naeem and Yasir Raza were part of the winning team, beating competition from the best universities in Pakistan. LLB students at Pakistan College of Law had previously won this Moot three times in a row. This success now brings the total to four. The picture on the below shows Judges of the Supreme Court of Pakistan and High Courts handing the trophy to the winning team. The second Moot, on Humanitarian Rights, took place over two days (30 November to 1 December 2013) at University College Lahore. LLB students Rubab Tariq, Faizan Daud and Shahayar Mamoon Sheikh won this Moot, along with Best Speaker and Best Memorial Award. Many congratulations to both of the winning teams on this great achievement.